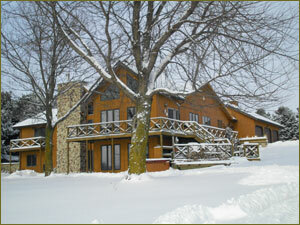 This rustic bed and breakfast is located on Adams Street, 1/2 mile west of the McKinley Lake in Creston, Iowa. The Tranquil hills and ponds of Southwest Iowa provide a magnificent view. This setting is a great place to walk, bike, hunt, fish or just relax. Adams Street Country Lodge Bed & Breakfast offers seven guest rooms and four bathrooms. the lower level includes four bedrooms, kitchen, living room and a large carpeted game room perfect for a relaxed evening. For added relaxation, a large whirlpool and sauna are located on the lower level. Many fireplaces provide guests with cozy spots to enjoy when the weather outside is cold and dreary. Cooking is my hobby, so you can expect fabulous food. Gardening is also reflected on the property. Watch your favorite program on the television. Beverages, snacks, and toiletries are complimentary. Breakfast will be to your choosing and a blend of antique and traditional furnishings create a comfortable elegance and lasting memory. Family reunions and wedding parties have beena large part of my business in the past several years. Extended stays and short term lodging has helped people make the transition easier than a hotel room. Call for special pricing.